Two fragmentary marble kouroi dating to the 6th century BC have been recovered in a police raid near Corinth (May 18, 2010, press release [in Greek]). This appears to have been the result of a surveillance operation and involved Austrian nationals. The statues measure 1.82 m and 1.78 m high, and showed evidence of recent breaks. They appear to have come from the same workshop. 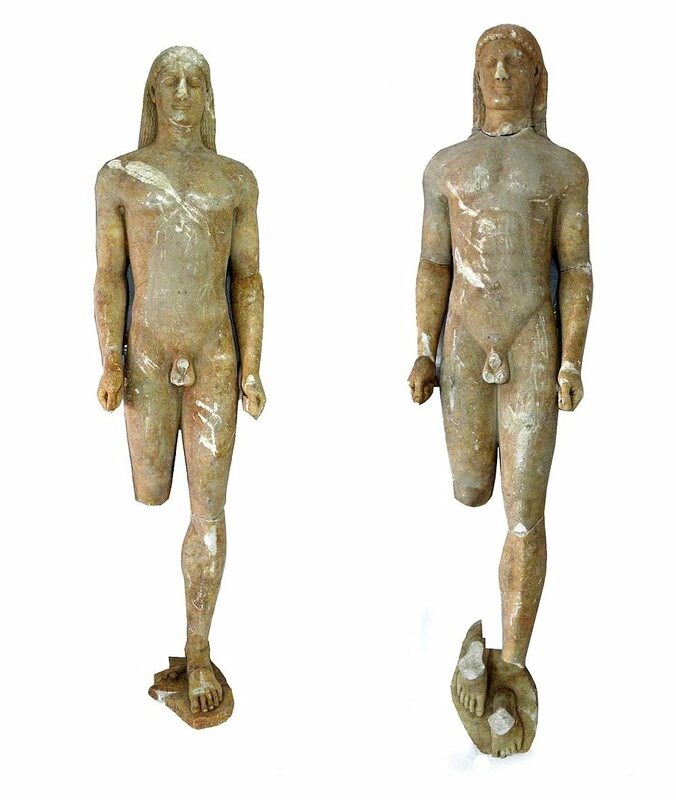 The statues will be sent to the National Archaeological Museum in Athens. Who would have purchased such recently surfaced antiquities? What was their original find-spot? Were the funerary or dedications in a sanctuary? Were they associated with any inscriptions? It remains shocking that objects of this size still surface as fresh loot and are traded... Anyone brazen enough to attempt to smuggle giant statues would have no qualms at all about the smaller things. Are there any Greek nationals involved ? The real loss is, as you say, the archaeological data. But there's a clue to what is going on here in the AP report: "Antiquities looting is a major problem in Greece, where treasures — by law all state property — can lie inches below farmers' plows or modern buildings, especially in cities like Athens that have been constantly inhabited for thousands of years." To the owner of a piece of land the highly valuable contents of your land belong to the state, therefore there is a perverse economic incentive not to preserve the archaeology of a find, but to loot your own property and sell it covertly. A classic tragedy of the commons. I think there is a simple solution - privatise the "archaeological rights" to a piece of land which could then be sold on to a specialist salvage company, AND create a 100% georgist tax on unprovenanced antiquities. This probably wouldn't eliminate looting and nighthawking, but it would be an incentive for property owners to look on archaeologists as business partners rather than agents of the state out to steal their birth-right. Also the tax authorities would be likely to be more efficient at policing the art market than the rozzers. I very much doubt that the owner of the land - if he were indeed to be involved in the looting, a situation that I very much doubt - would get anything like the free-market value of the goods in question. I don't know exactly what the Greek gov't pays landowners, but even if it's a small fraction of what the object would get at auction, it's probably more than the landowner would see from middlemen in the looting business. So I can see that this would hasten the "surfacing" of collectables on the mareket, but then archaeological sites contain much more than the sort of things collectors want to buy, so specialist (art-object) salvage firms are not going to bother with ths slag and snailshells, animal bones or any of the other nitty-gritty of archaeology. So how would you go about protecting SITES from being dug up for commercial ends, that is the point isn't it? How for example would you adapt the current Greek law to make the provisions you propose in order that it makes a coherent system? Let's see a concrete proposal. For the document noted by Paul Barford click here. It would protect sites because of the second part of my proposition, Paul. Consider the following. I own a field where I suspect there is an archaeological artefact. If I dig it up on my own I know I'll nullify the commercial value of whatever is in there, so I sell the rights to a private enterprise archaeologist (if you don't like the term salvage). She takes on the economic cost of excavating the site to the satisfaction of a county archaeologist, who can then award a tax exemption on what is found in there. Leaving her free to sell it on the open market. As for what the Greeks can do - well, without bothering to read the document you link to I can already summarise it thus "dear private property owner: we own your stuff so f*ck you". At the very least they could start by asking how well the existing nationalisation of antiquities is doing at preserving them (hint:not very well). I generally agree with Lysias. Here in Cyprus, I have seen looting going on that can only have been conducted WITH the consent of the land owner, and that appears to be condoned - at least partially - by the authorities. If there is no "real" incentive to hand over archaeological material to officials, i. e. if there is no financial compensation that the landowner feels is equivalent to what he would get from a middle-man (or -women), then there is (most likely) no way that he/ she is inclined to do so. May I draw your attention to Bernard Fischer's excellent paper "The Grand Compromise" (Cultural Heritage and New Technology, Vienna, 20/10/2006). It does not help to insist on international conventions, codes of ethics, norms and legislation when reality shows that they don't or only occasionally work. We might have to find alternative solutions. One way would be to separate possession from ownership, so that source countries could enter "a deal" with museums and research institutions on the "consumer side". "Antiquities Leasing" as proposed by Derek Fincham might be such a solution, and Lysias' proposal, maybe in a less radical form, is surely worth more than just a thought. And if there really was a museum willing to buy these kuroi, and if Greek authorities really know who was behind this loot, then they should be transparent and make it public. If however, this is not the case, then they should not put any assumptions into the orbit. How disappointing to know my solution is radical. You're going to get me drummed out of the next libertarian wingnut chapel meeting. It's not about preserving artifacts, it's about preserving sites. I also wonder why you assume that the Greeks would agree with you about who _should_ own buried antiquities. My experience is that many are glad to have the state be the owner. As for how well the system is working, that might perhaps be one of those Churchillian things: It's the worst one, apart from all the others. That is quite an absurd assumption that these kouroi were going to be bought by a museum. Western museums are under intense such scrutiny today trying to hold on to what they'v already got, let alone acquiring more, with very little funding, that its hard for them to acquire minor archaeological objects with clear provenance, let alone extremely important ones with no provenance. In fact most major museums have ceased acquiring antiquities all together. Clearly Greek nationals were complicit in unearthing objects of this scale. And the diggers were quite naive in thinking that any collector or institution would purchase such obviously illegally excavated pieces of such great importance. No museum, collector, or auction house would have ever touched this stuff nowadays. "And the diggers were quite naive in thinking that any collector or institution would purchase such obviously illegally excavated pieces of such great importance. No museum, collector, or auction house would have ever touched this stuff nowadays". That's really good to hear... if only we could believe it was true. Why are US antiquity collectors currently fighting the US signing a cultural property MOU with Greece concerning imports of material without valid export licences? With Italy too. And Cyprus and China. Sorry, but who did you say was being "naive"?